Love minty fresh breath? If you swig mouthwash throughout the day, you may set yourself up for a sore mouth. That’s because some products have acids that make already-sensitive teeth worse. The solution: Ask your dentist about neutral fluoride rinses or those that lower sensitivity, and what ingredients to avoid. Can’t get enough tomatoes, citrus, fruit juices, and other goodies that make your mouth water? Your teeth can. Enjoy too many acid-rich foods and drinks and you could erode the outer covering of your teeth, called enamel, and expose the tender layer beneath, called dentin. Don’t want to give up these tart favorites? Cut the acid with a piece of cheese or glass of milk after eating. Just about everyone wants a brighter smile, but tooth whiteners and toothpastes with peroxide-based bleaching solutions can cause sensitive teeth. The feeling is often goes away once you stop using the product, though. Want the best option for you? Talk to your dentist. If you brush too hard or don’t use a soft brush, your gums can pull away from tooth roots. This can also wear away your enamel and expose dentin (yellow). Holes in the dentin are the tiny tubes (blue) that allow hot, cold, and sweet foods to affect tooth nerves. Ouch! 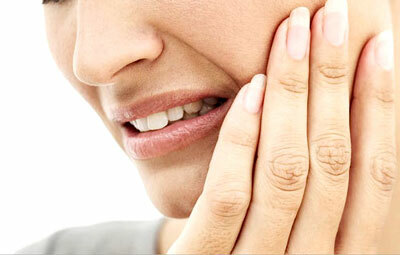 Munching ice, biting into hard candies, or having large fillings can lead to chipped, broken teeth. Once a tooth is cracked, the nerve-rich pulp hidden deep inside may become irritated when chewing rubs the cracked tooth pieces together. A crack may also fill with bacteria, leading to inflammation, which can cause more pain. Tooth enamel is the strongest material in your body, but it’s no match for the power of clenching or grinding. Over time, both of these often-mindless habits can wear away enamel, leaving the nerves in danger. Mouth guards, lifestyle changes, and diet tweaks can all help stop the wear and tear. Decay, like this cavity, exposes the root of your tooth to a host of irritants: hot, cold, sweets, even air. The best ways to battle decay and keep your teeth in top form are to practice good oral hygiene, eat right, and see your dentist regularly. You don’t have to go it alone — talk to your dentist to find out what’s behind your sensitive teeth. To strengthen your pearly whites, you may need to make a few more changes to your oral care routine. You could switch to a soft-bristled brush, use a toothpaste for sensitive teeth, or try a mouth rinse with fluoride.